That's an ugly movement but this is afterall a cheap movement that is not targetted at the discerning watch collectors. 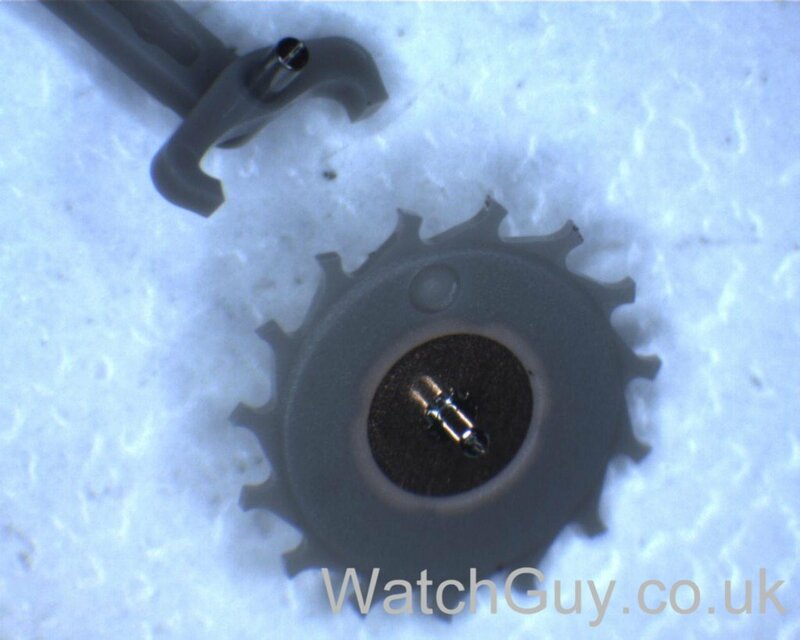 Also is the escapement truely plastic? I won't ignore the possiblity that it might be silicon. It looked like plastic to me, but not all plastics are created equal. If it's just the stuff ordinary everyday objects are made out of, it'll self destruct pretty quickly. I wonder how they react to varying temperatures. I wouldn't mind the bad performance and construction if it were cheap. But the Seiko 5 is apparently far superior and available for a third the price if you shop around. Even assuming the price comes way down on the Swatch, it'll still be twice as expensive. Seiko 5s are being made now with 4R36s that hack and handwind too, further making me to wonder why you'd skip a decent but metallic watch with a proven metallic movement for the far more expensive plastic watch and plastic movement Sistem51. Other than curiosity anyway. Or funky looks, which I understand. Alllllllll that said, I have been able to test a Sistem51 on a Timegrapher, dial up position alone, and it did fine there. Not great, but fine for the price point. adi4, DM71, Marrin and 1 others like this. So - too early to state that currently, this Swatch movement is the absolute worst auto-movement made these days? I had high hopes for these, despite the styling. Now I'm glad I didn't pick one up, they weren't kidding when they said they were disposable! Subscribed to this thread, it could get interesting. Thanks for sharing. adi4 and X2-Elijah like this. Still better than Grand Seiko. sumanbhadra and OrangeSport like this. If any company could possibily do it for that price, it would be Swatch Group. But the blown up pics from Citizen M seems to suggests otherwise though. Agree, but I'm not sure what this trying to compete on with the 4R36 besides disposability. I guess that's a feature to be touted now? They could, however they seem to be going for the opposite of value here. All times are GMT +2. The time now is 03:06.